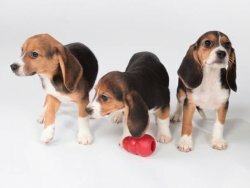 Our Antibody Profile Defined/Specific Pathogen Free (APD/SPF) Marshall Beagles® are the cleanest beagles available, making them the best canine model for developing new veterinary medicines and vaccines marketed for pets. These dogs display everything one should expect from a typical Marshall Beagle®, including the same calm and gentle temperament. This colony is raised in a complete barrier environment and remains unvaccinated. The dogs are antibody negative for many common canine pathogens including Adenovirus Types 1 and 2, Distemper, Herpes Virus, Parainfluenza, Parvovirus, Rabies, Borrelia, Erlichia and Leptospira. They also remain free of sub-clinical infection including Giardia and Coccidia. Preshipment screening for additional pathogens is also available upon request. Please contact us for pricing or for more information about availability of APD/SPF Marshall Beagles® in your region.